Sabancaya is an active volcano in southern Peru. In 1994 a mummified body was found high on the neighbouring mountain of Ampato by Johan Rheinhard. It had been revealed by the glacier melting due to the heat form Sabancaya volcnao. You can read about it in his book "The Ice Maiden". Sabancaya was erupting every couple of hours in May 2017. Often accompanied by small earth tremors! Ampato on the left and Sabancaya on the right as seen from the 4900m high pass of Patapampa above Chivay, Peru. 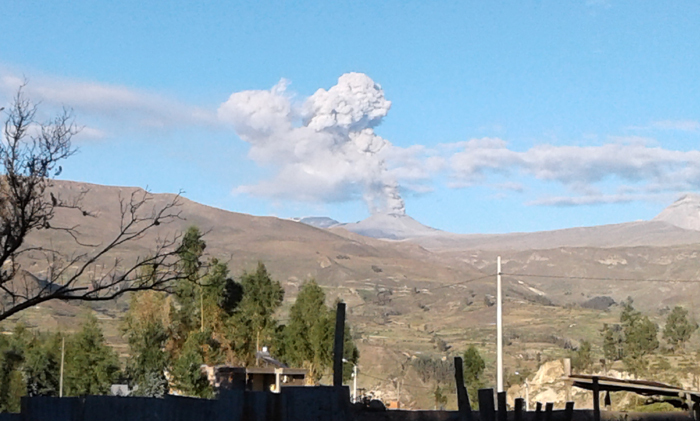 Sabancaya erupting in 1994 as seen from the upper slopes of Ampato, near Arequipa, southern Peru. We have climbed in this area before and can organise more guided ascents of this peak. For details of how to climb Sabancaya, Ampato and the neighbouring peaks of Misti and Coropuna, please see our guidebooks, which are available in English, Spanish, Polish and French editions, direct from us or from all good bookshops and mountaineering shops.